Faculty and students are invited to contact LED about projects for collaboration. The Learning, Education, and Design (LED) Lab is a community of scholars whose shared goal is to investigate how instructional technologies and digital media are used to innovate teaching, learning, and collaboration. Members of the lab come from several programs at Michigan, including information, education, psychology, survey research, and the professional schools (e.g., medical education). 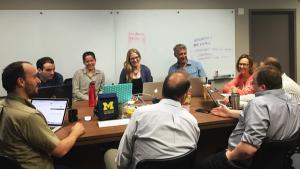 The LED Lab is committed to providing a significant contribution to scholarship about learning at Michigan and in the broader field as well by building an empirical evidentiary base for the design and support of technology rich learning environments. Learning can be personalized for every student in order to better meet their needs, goals, and motivations. This personalization is achieved at scale through learning environments supported by technologies and pedagogical practices. We use empirical evidence and research to discover the best ways to support diverse learners, and to inform the design and implementation of learning environments aligned with the needs of all learners. Our research supports diverse communities of learners to create more inclusive, dynamic learning environments. Learning happens in conversation with and in communities and cultures. Whether we are describing the norms of a field or the practices of a profession, learning environments must be designed in ways that enable students to learn from each other, and grow towards full participation in a field or profession. From a scholarly perspective, this principle contributes to our understanding of how learning is mobilized in learning communities through the interaction of actors and resources. To design learning at scale we investigate how large informal learning communities (even in the context of a formal course) come together and change over time. The individual learner – using various metrics about student performance, including their strategies, and potential pathways for success (in a course, in their major program, and as they navigate the institution at large). The class – examining how aspects of the course (size, type, timing) relate to student experience. The instructor – examining instructional strategies (the timing of assessments), the choice of instructional resources (textural, video, etc), and the organization of the curriculum (course sequences). The campus community – examining organizational pathways through the degree programs and how different resources outside of the classroom are aligned to support multiple paths for different kinds of students. We understand that technology plays a pivotal role in how knowledge is created, disseminated, and shared. Our research addresses how these technological innovations for teaching and learning can be both intellectually engaging and practically useful for both scholars and practitioners. Through empirical evidence and research, we aim to understand how to support unique learners’ needs and design technologies that help motivate students to become effective lifelong learners. We have a wealth of data available to us. The interdisciplinary nature of our approach to learning means that we collect data on performance, motivation, affect, activity, and more. LED Lab researchers work with these different data sources and apply various theoretical frameworks to ask and answer innovative research questions. Using data from a breadth of data sources, we aim to create a holistic story of student learning that crosses disciplinary and methodological boundaries. Our research is pragmatic, and our commitment to making it applicable is part of the research process itself. Our research focuses on improving the learning environment through research findings that instructors, students, staff, and software developers can implement in their practice. Through iteration and evaluation we build a foundation for new advances in technologically enabled learning.